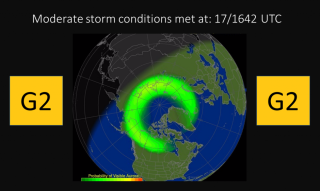 G2 (Moderate) geomagnetic storm conditions were observed on July 17 at 12:42 pm ET (1642 UTC due to continued activity from a coronal mass ejection that arrived on July 16. After a coronal mass ejection from the sun hit Earth's magnetic field on Sunday (July 16), space weather forecasters predict that geomagnetic storms may cause some intense auroras this evening (July 17). Conditions of moderate geomagnetic storms could be seen as far south as 60 degrees latitude, according to a statement by the Space Weather Prediction Center run by the National Oceanic and Atmospheric Administration. The class G2 magnetic storm (a moderate storm) was triggered by solar particles ejected from a coronal mass ejection on Friday (July 14), SWPC officials said in an update. Local meteorologist Mark Tarello shared views of the northern lights over Minnesota on Sunday night. Space meteorologist Tabitha Skov has shared this five-day outlook, showing the geomagnetic storm's activity through Wednesday (July 19). Editor's note: If you have an amazing aurora photo you'd like to share with us and our news partners for a possible story or image gallery, please contact managing editor Tariq Malik at spacephotos@space.com.